Cabo San Lucas is known for its world class deep sea fishing. 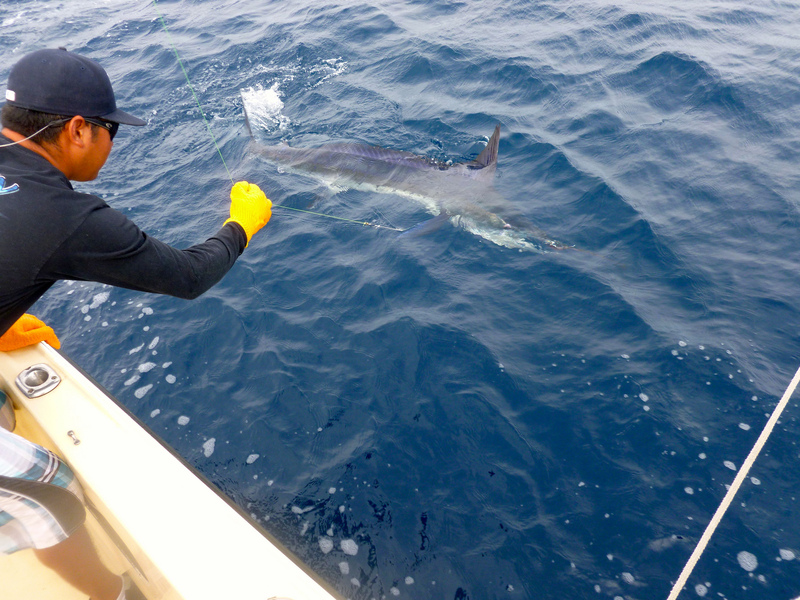 Due to the consistently-beautiful weather conditions, fish in Cabo bite year-round. No matter when your vacation is scheduled, there is never a bad time to go sport fishing in Cabo San Lucas! Bad Medicine is a Cabo Yacht Sportfisher equipped with a crew to help you get the most out of your deep sea fishing trip. The crew has been in the sport fishing business in Cabo San Lucas for over 15 years! These experienced fishermen know how to locate the fish in order to maximize your Cabo fishing experience. With this skilled crew, you don’t need to be an expert fisherman in order to enjoy your time aboard the Bad Medicine. Bad Medicine is not only the ideal Cabo fishing boat; it is also a luxury yacht in perfect condition. The high ceilings, wood floors, and large windows of the spacious salon will have you feeling like a celebrity while you hang out in the comfortable interior. Air conditioning and wrap around leather sofas provide the perfect area to relax and cool down. Bad Medicine’s exterior is equipped with shaded seating areas to keep you cool in the Cabo heat. The top of the line cockpit space holds a fighting chair, to assist in landing large fish. Bad Medicine also has a super bait tank system and fish storage for sport fishing expediency. A variety of fish species can be caught in the Cabo San Lucas area. Some of the popular fish include: snapper, marlin (striped, blue, and black), yellowfin tuna, mahi-mahi, and sailfish. At certain times of the year, certain species are more prevalent in the Cabo waters. The Bad Medicine has won many fishing tournaments over the past 15 years. The most recent win was the granddaddy of them all, the Bisbee Black and Blue Tournament in 2011! Interested in learning more about Bad Medicine Sportfishing? Check out their website. Come stay and fish in Cabo San Lucas.